On the 4th (Tue), contemplate in the serene atmosphere at Kamppi Chapel of Silence. Get ready for a full day of sightseeing on the next day: steep yourself in history at Seurasaari Island and Open-Air Museum, brush up on your military savvy at Sea Fortress Suomenlinna, then contemplate in the serene atmosphere at Uspenskin Cathedral (Uspenskin Katedraali), then don't miss a visit to Market Square Kauppatori, and finally take in the architecture and atmosphere at Helsinki Cathedral. For ratings, maps, reviews, and other tourist information, read our Helsinki travel itinerary planner . London, UK to Helsinki is an approximately 6-hour flight. You can also do a combination of flight and ferry; or do a combination of car and train. The time zone difference when traveling from London to Helsinki is 2 hours. Expect a daytime high around 21°C in June, and nighttime lows around 11°C. Cap off your sightseeing on the 6th (Thu) early enough to go by car to Porvoo. 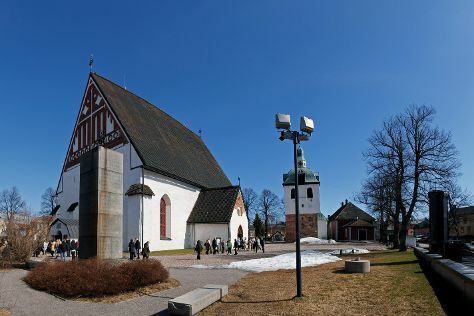 On the 7th (Fri), steep yourself in history at The Runeberg Home, admire the landmark architecture of Cathedral of Porvoo, then look for gifts at Riimikko, then don't miss a visit to Porvoo Old Town, and finally stroll through Fredrika Runebergs Park. For reviews, photos, other places to visit, and tourist information, you can read our Porvoo trip itinerary builder site . Traveling by car from Helsinki to Porvoo takes an hour. Alternatively, you can take a bus. In June in Porvoo, expect temperatures between 21°C during the day and 11°C at night. Finish your sightseeing early on the 7th (Fri) so you can travel back home.